1944 Drafted Army then took qualifications to enter the Army Air Corps. 1944 Basic training in Miami Beach, Florida his barracks were a hotel. 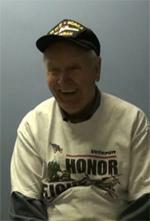 1945 William was a Flight Engineer for a B-24 Liberator. Went overseas by Flying from California, to Hawaii, to Canton, to some smaller islands, then onto New Guinea which took 6 total days. William and his group made their way to the Philippines then Okinawa, Japan then finally to a little island called Oshima, Japan. 1945 As a flight engineer William was responsible for securing gas tank, check mechanicals, hydraulics, electric power units, ailerons, and anything else needed to make a successful flight. He stood in between the pilot and co-pilot. 1945 William completed 15 missions in the B-24. 8/28/1945 William was sent to Japan to see if operations could air borne into the area. He was one of 50 Army pre-occupation personnel in Japan and was actually there before the Japanese surrendered. This is a memory that sticks out the most to William at it was something special. Although the atomic bombs were dropped on August 6th and 9th of 1945 the official surrender did not take place until September 2, 1945 aboard the USS Missouri. For two days, 3 minutes apart a 100 mile sky train of C-54’s delivered supplies.